The sun was shining bright when we dropped anchor at Mykonos, the first of three Greek Islands that we would visit on our trip. I knew very little about the island except that it was supposedly a playground for the rich and famous. The ship anchored off the coast and I got to take my first trip on a tender boat. They’re small boats that pull up alongside cruise ships and ferry people to shore. Up to this point in my life I had very limited experience with boats and ships so all of this was incredibly exciting. I remember that the sunlight gleamed off the white stone buildings of the island and I have never seen water as blue as I did there. As the tender got closer I saw the teeming mass of people. It took a minute to register in my brain, then I remembered that there were two other cruise ships in port that we had passed on our way in. Including the passengers on our ship that meant that there were at least 7000 tourists all clamoring around this tiny island. Once on shore, we started wandering around, trying to take it all in. We got off the main drag as quickly as possible to put a bit of distance between us and the rest of the wandering visitors. 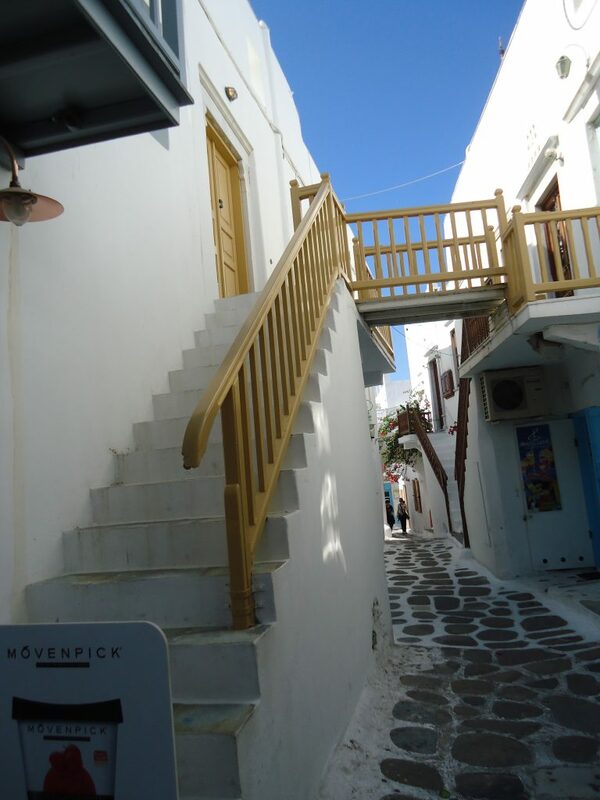 We found that all the little alley ways off the street also were lined with tiny shops and stopped into to some of the less crowded ones to look around. I quickly found out that most of them sold variations of the same items. Tissue think shirts of blues and whites, jewelry (usually of the same color combinations) and trinkets galore to remind you later that you had been to Mykonos. Eventually, we wandered far enough to find ourselves almost completely out of the main tourist area. The alleys took on a quieter tone there were house and apartments where the residents of this gorgeous island lived instead of the shops where they worked. We took our time and enjoyed the peace as we wandered around and took it all in for well over an hour. As the day got later we got hungry and made our way back in the general direction of the dock and tourist area. 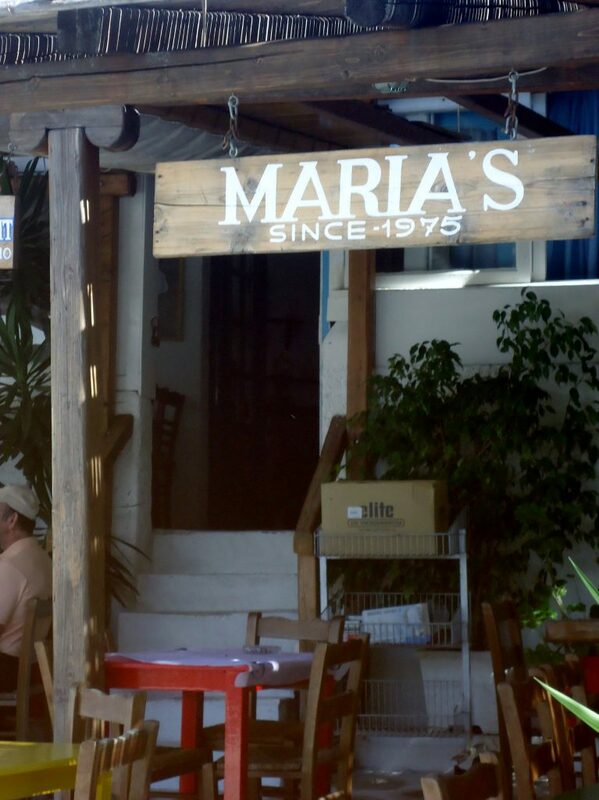 Before we got back to the beach we came across a wooden sign in front of a small restaurant called Maria’s. There was plenty of outside seating and the man standing outside happily sat us at a table that was mostly in the shade. I decided to keep it simple and try the moussaka. 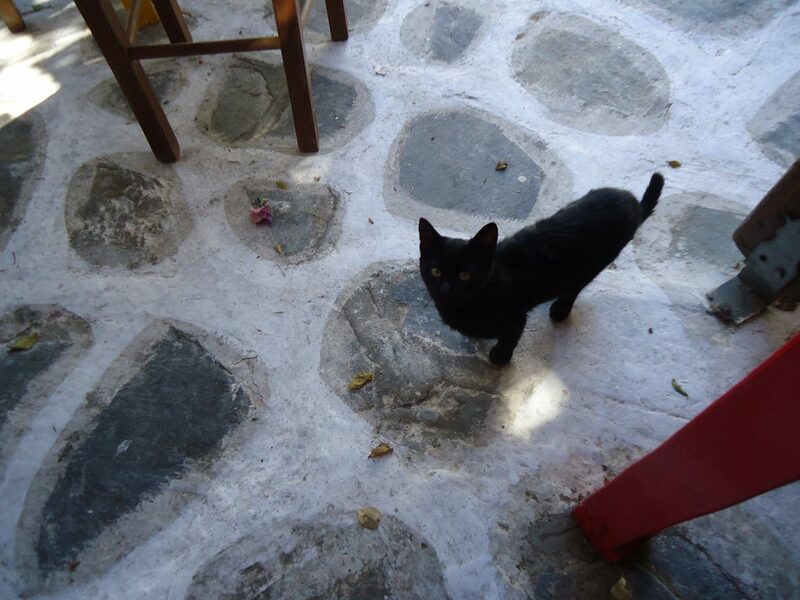 As we waited for our food I noticed an abundance of cats wandering around. 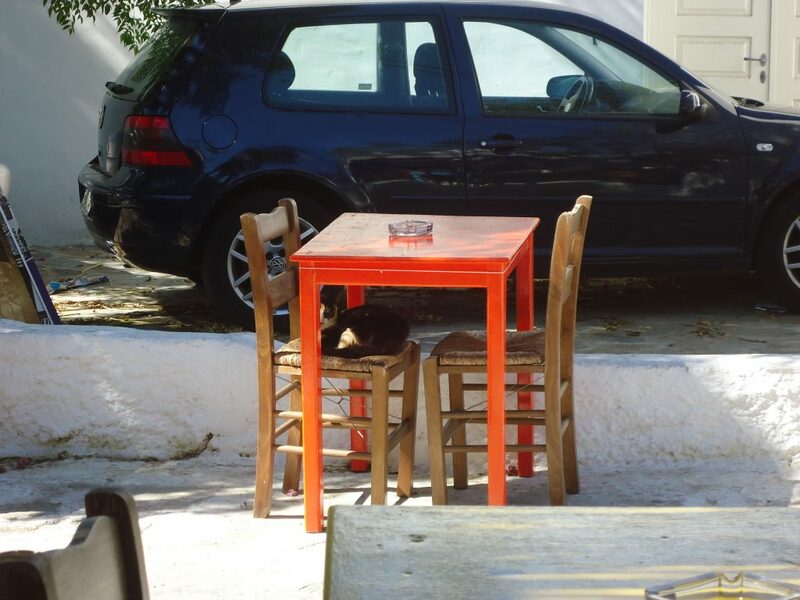 They were walking under the tables and even hopping up on the couple of cars parked nearby. 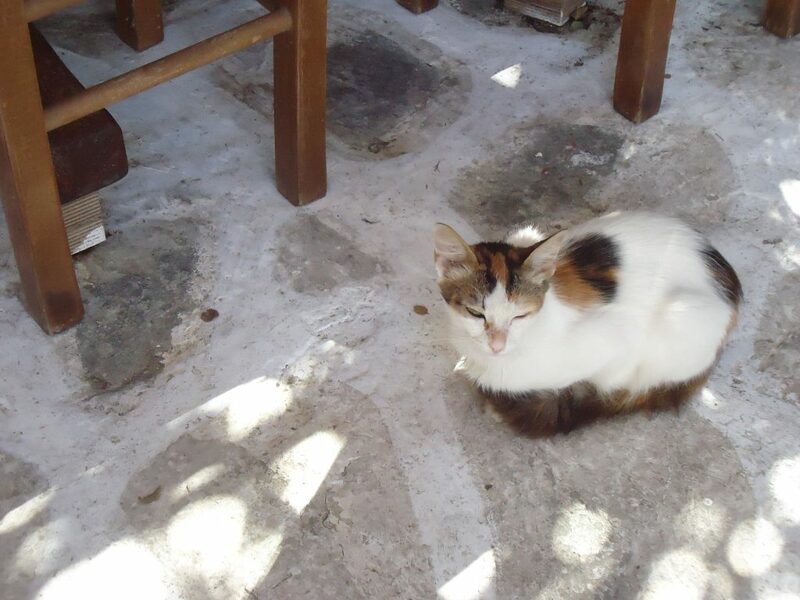 After a few minutes they were coming closer and eventually were rubbing against my leg and curling up under the table. a dry anise-flavored aperitif that is widely consumed in Greece. The waiter laughed and said “Of course, of course.” before hurrying inside. 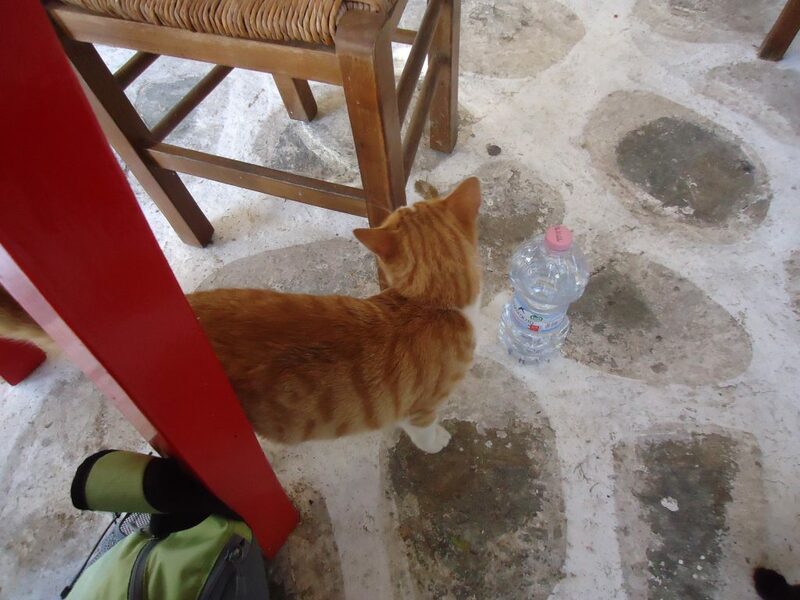 He quickly returned with two small glasses and a bottle of Ouzo. He poured us two shots of the clear liquid and then asked if we wanted to add water. While trying to not look like a complete amateur I politely refused and figured I’d give it a try neat to get the full taste of it. I must have grimaced at my first sip because he started laughing and then told us that even the people that drink it all the time add cold water to it to dilute the taste a bit. After that tidbit of information I happily agreed to add the cold water and enjoyed the rest of my drink much more. We paid and thanked him for the delicious meal and insider information before we made our way back down to the beach. On the walk back to the dock, we stopped into a beach-side restaurant for a piece of Baklava. We sat outside and people watched as we ate the honey covered pastry. Actually we also watched a large pelican wander around the tourists and squawk at them while flapping his giant wings until he got bored and found a perch on a wooden post a few feet out into the water. 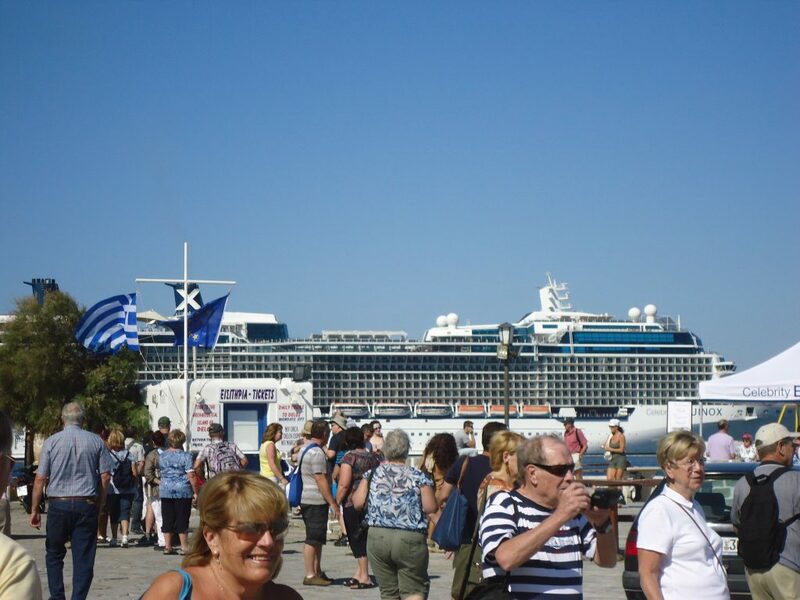 As we got back to the dock the tourists were swarming again and we made our way back to our cruise ships tent to find out where we would meet our tender back to the ship. While we waited I saw people returning scooters to the stands near our dock. It was only then that I found out that I could have rented a scooter for the afternoon to wander further into this gorgeous island. 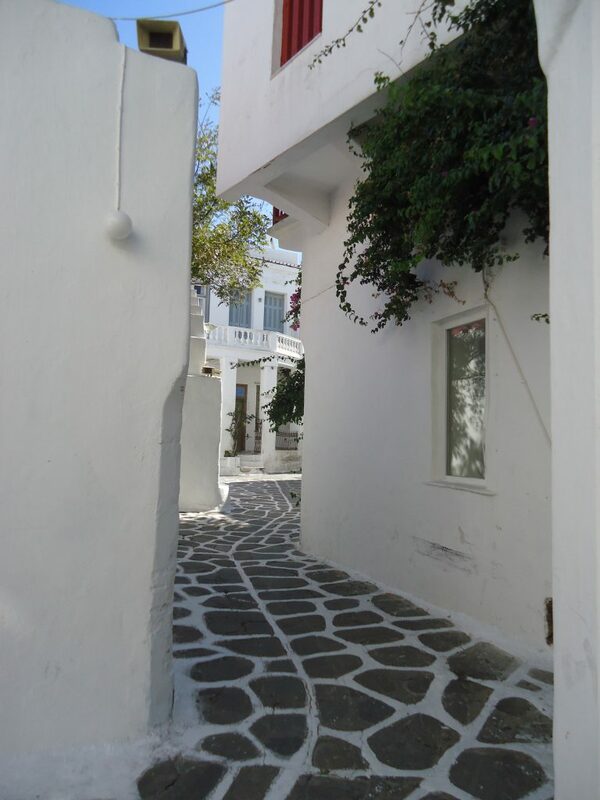 TIP: Unless something has changed in the last few years you can rent a scooter on Mykonos using only your valid drivers license. Shortly, we were back on the tender and heading back to our ship which would sail through the night and bring us to our next port, which would be Ephesus in Turkey.